“Puerto Rico is Trump’s Katrina, times 1,000,” says Rosa Clemente, comparing the aftermath of Hurricane Maria to the humanitarian crisis in New Orleans in 2005. Clemente is a community organizer active with Black Lives Matter and a doctoral candidate in the W.E.B. Du Bois Department of Afro-American Studies at the University of Massachusetts, Amherst, although she is best known for her 2008 Green Party vice presidential candidacy. With family members in Puerto Rico, Clemente knows through direct testimony how desperate circumstances are in the U.S. territory right now. “This is 3.5 million human beings that, in a couple of days, if relief is not provided, we’re going to see massive amounts of deaths,” she explained to me in an interview earlier this week. He then spent his weekend manufacturing a controversy over NFL players who were protesting racism by refusing to stand during the national anthem. He first raised the issue at a campaign speech for a fellow Republican in Alabama on Sept. 22, and went on to engage in a massive tweet storm through Monday, in what some speculated was an attempt to rally his base in the face of flagging poll numbers. Finally, five days after his initial tweet about the island, Trump published a series of three more tweets that were incredibly callous. “Much of the island was destroyed, with billions of dollars owed to Wall Street and the banks, which, sadly, must be dealt with,” the tweets said. For the president to bring up Puerto Rico’s economic crisis and its debt to corporate America during a time of tremendous suffering is shocking, even for Trump. The fact that he accompanied this statement with very little action to actually help Puerto Ricans intensified the cruelty of his words. “Everything [Trump] says enrages Puerto Ricans in the diaspora like me. It should be enraging everyone,” Clemente says. While a majority of Puerto Ricans have been without power, water or cellphone service for nearly a week, Trump’s White House decided to wait until nearly two weeks after the hurricane hit to even consider an aid package. Waiting that long means that “a lot of people are going to die,” Clemente believes. He concluded by announcing that he would visit the island a whole week later. Puerto Rico today is ground zero for American disaster capitalism. The electrical grid, which, Trump lamented, “was in terrible shape,” was neglected because the Republican Gov. 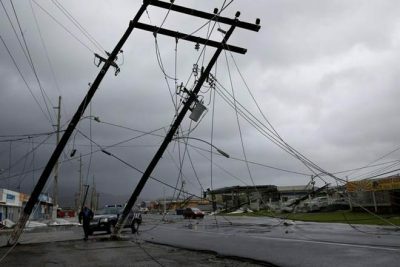 Rosselló “for the last two years has been paying the debt as opposed to fixing the electrical grid,” Clemente says. The island’s crumbling infrastructure was apparently less important than its debt repayments. Then, the hurricane hit and Puerto Rico went dark. The governor estimates it could take months to restore power. On the mainland, Puerto Rico rarely enters into our national consciousness, even though it has a population greater than more than half the states in the nation—roughly the same as Connecticut. “Because Puerto Ricans have always been relegated to second-class citizenship, I even wonder how many Americans know that Puerto Ricans are American citizens,” Clemente says. A new poll answers her question: Only 54 percent of Americans realize that Puerto Ricans are U.S. citizens. What Puerto Rico needs immediately is action from the executive branch. If Trump cared even slightly about Puerto Ricans, not only would he expedite the aid package, he would have immediately suspended the Jones Act, a shipping restriction that prevents nations from docking at Puerto Rico’s ports and directly delivering aid. The Trump administration’s initial refusal to grant a waiver for the rule invited harsh criticism from his fellow Republican, Arizona’s Sen. John McCain, who called it “unacceptable” in a letter to the Department of Homeland Security. Only under massive public pressure did he decide to lift the restrictions on Thursday. Puerto Ricans had to wait more than a week after the hurricane hit before their colonial master decided to allow supplies to be shipped directly to the island. Just as it is impossible to separate Puerto Rico’s economic crisis from its status as a U.S. territory, it is impossible to disentangle the devastation of the hurricane from the man-made disaster stemming from the island’s subservient relationship with the U.S. Corporations similar to Trump’s have taken advantage of subsidies and handouts in Puerto Rico, leaving islanders saddled with more problems and more debt. More than 10 years ago, musician Kanye West remarked that “George Bush doesn’t care about black people” during a fundraising telethon for victims of Hurricane Katrina in New Orleans. Clemente expressed similar sentiments about Trump this week. “He is a soulless human being. He has no empathy. He does not care,” she says. Although so far Hurricane Maria has caused fewer deaths in Puerto Rico than Hurricane Katrina caused on the U.S. mainland, in Clemente’s eyes the scale of the catastrophe facing Puerto Ricans potentially eclipses that of Katrina and its aftermath. Sonali Kolhatkar is a columnist for Truthdig. She also is the founder, host and executive producer of “Rising Up With Sonali,” a television and radio show that airs on Free Speech TV (Dish Network, DirecTV, Roku) and Pacifica stations KPFK, KPFA, and affiliates. She is the former founder, host and producer of KPFK Pacifica’s popular morning drive-time program “Uprising.” She is also the co-director of the Afghan Women’s Mission, a U.S.-based non-profit solidarity organization that funds the social, political, and humanitarian projects of RAWA.